Male: Mostly grey-brown with a black cap. Female: Similar to the male but with red-brown cap. The Crossbill is a heavily built finch, a little larger than a Greenfinch, with a larger, thicker bill with mandibles that cross at the tip. The lower mandible may bend either to the left or right. The tail is deeply forked. The male is mainly brick-red, but its crown and rump are brighter, and the wings and tail are a dark brown. The female is green-grey with a paler yellow rump. The back, wings and tail are a dark grey-brown. Juveniles are mostly grey-brown with heavily streaked underparts. Another species of Crossbill, the Scottish Crossbill, is endemic (unique) to the Caledonian forests of Northern Scotland and is very similar in size and appearance. The call is a distinctive "jip-jip-jip". The song, which may be delivered from a perch in in flight, is a soft twittering of short trills. As indicated by their crossed bill, the Crossbill is a specialist feeder on conifer seeds, in particular larch, pine and spruce. They will also feed on other seeds, berries and invertebrates. Cone crops are often sporadic and vary from region to region, consequently Crossbills are nomadic. The nest is a small cup constructed by the female from conifer twigs, moss, lichen, and grass, and lined with finer grasses, hair and wool. The nest site is usually high in a conifer tree. Breeding is dependent on the cone crops and in some years they may start breeding in August and continue through the winter and in to spring. The female Crossbill lays and incubates eggs that are smooth, glossy and pale blue with sparse purplish markings at one end. The eggs are about 22 mm by 16 mm. Both parents feed the young after they have hatched. If the weather is extremely cold and the female is unable to brood the chicks all the time they can reduce their metabolic rate to save energy. 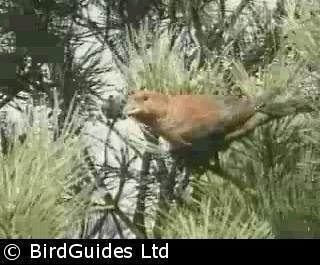 Crossbills frequently leave one area of forest for another as a result of the sporadic nature of the cone crops. They are unique in that they usually migrate just once per year, around July, when they go in search of ripening cones if their local crop is inadequate. Conifer plantations have helped the Crossbill, but there's little else that can be done for such a nomadic species.